Over the last month, our mobile team worked on improving the login screen. It's now much more beautiful, and most notably uses the intuitive interface that you're used to from the web version. We know you adore the visual encoding feature on our web application. Visualization of different work items according to their state or condition helps you to quickly observe your team or project status, notice any blockers or impediments, and differentiate cards with just a glance at the Board. You can easily setup visual encoding rules from the web application, and can now enjoy its benefits on our iOS app! Annotations of visual encoding rules applied to a particular Board are available at the View Setup menu on your iPhone or iPad. 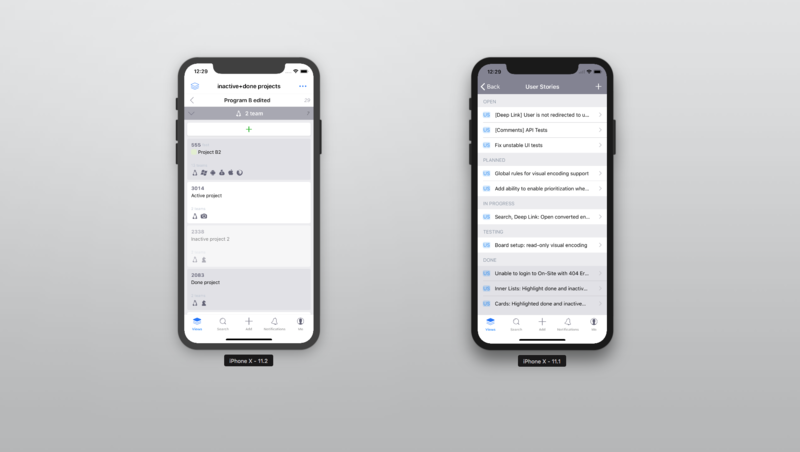 Done and inactive cards for Iterations, Team Iterations, Releases, Projects, and Users are now highlighted in grey and can be explicitly distinguished from other cards on Boards and inner lists. We've added support for converted entities. The app will now automatically redirect you to the new (converted) entity view when opening it from Search, the Notifications tab, push notifications, or deep links. Please feel free to share any thoughts you have with us. Use the Feedback form in the app's 'Me' tab, or shoot us a message at mobile@targetprocess.com.